Ever since we become more health conscious and adopt a whole food plant-based diet, myself and my wife are very selective in term of where we eat out. No doubt, initially, we were sad to have to forgo a lot of our favourite eating places that we often visit before. However, thanks to the comprehensive Singapore Vegetarian Food Guide published by the Vegetarian Society of Singapore, we soon found ourselves happily exploring new eating places around this little red dot. Singapore is definitely a food heaven for vegetarian! Although not all of them meet our “healthy standard”, there is no lack of places that serve healthy and tasty foods! In this post, I will list out my top 3 favourite places to eat out. 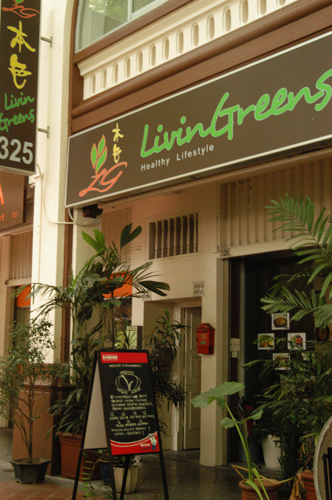 Update 22/12/2013 : LivinGreens has re-located to 89 Rangoon Road URBAN LOFTS # 01-04, just a short walking distance from the Farrer Park MRT Station Exit B.
Update 22/12/2015 : Unfortunately LivinGreens has closed down due to high cost of rental. On the top of my all time favorite is this little café along Beach Road: LivinGreens café. I find this is THE healthiest eating place all over Singapore. It serves ONLY wholesome organic vegan foods with a comprehensive selection of Western and Asia dishes on its menu. Among my favorites are the three varieties of Dumplings: mushroom, red spinach, and vegetables – they are delicious! I can finish a whole plate of seven dumplings by myself as a side dish! I also like the Sheppard Pie and the Buns (包子) that are freshly made daily. My wife, who used to have a sweet tooth, loves the cakes at LivinGreens! A cake is made fresh daily and it is normally egg-free, gluten-free, sugar-free, and dairy-free – and most importantly taste great! When you are at the café, don’t forget to talk to the owner, Barbara. She is also the chef of all the creative dishes on the menu. She is very friendly and will give you advice on how to eat healthily. Update 12/08/2014 : 7 Sensations has re-located to 279 Jalan Besar, Singapore 208943. Update 25/1/2016 : Unfortunately 7 Sensations has closed down due to high cost of rental. 7 Sensations has been one of my favourite vegetarian restaurants even before I become more health conscious. It has been around since 2005. Previously at Madras Street in Little India, it only moved to the current place at Parco Marina Bay at Millennia Walk since last year. The current location, with its proximity to the Promenade MRT station, is an excellence place for us to meet friends in town. It has a wide selection of Western, Peranakan, and Sushi dishes on its menu. I and my wife like the DIY Popiah set the most. The ingredients are always fresh and the chili is out of this world. It is a must have for us every time we eat there. Gado Gado isnext on our most favourite dishes. 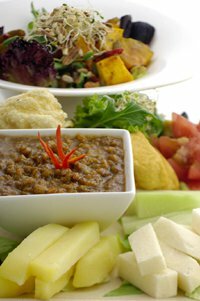 Cashew nuts are used, instead of peanut, in the Gado Gado sauce – the recipe for the Gado Gado sauce is a secret! 7 Sensations is not a vegan place, there are some dishes that has cheese. However, there is a Vegan Pizza with tofu cheese on its menu. I prefer the Vegan Pizza at 7 Sensations compare to the in LivinGreens. The texture of the tofu cheese is really nice. For those who crave for hot and spicy local food. There are also a slew of excellent Peranakan dishes: Sambal Petai, Buah Keluak, Asam Fish Curry, etc. Just to name a few. I can feel my saliva almost dripping now! 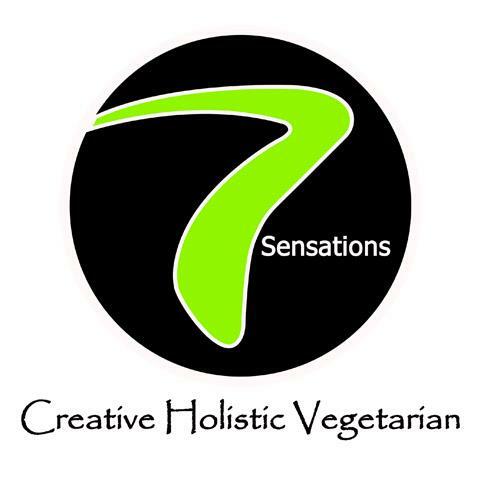 7 Sensations is a very good place for a healthy vegetarian meal. Real Food Café is located at the basement of the Central along Eu Tong Sen Street, right next to the Singapore River. It is also a very convenient meeting place with the Clark Quay MRT station accessible from building of the Central itself. Real Food Café serves only food with organic ingredients. It has a comprehensive menu covering salads, pizzas/pasta, noodles/rice, sandwiches, desserts, and juices. This is a vegetarian place which also serves food with eggs and dairy. Next to each item in the menu there are indicators where the item is suitable for vegan, whether it contains onions/garlic or whether it is wheat/gluten free. My favourite food at Real Food is definitely the Burgers. The homemade patty is made from fresh whole food ingredients and is serve in an oven baked whole meal bun. The taste is out of this world. It is definitely a must try! 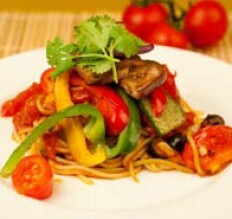 I also like the Grilled Veg Tomato Pasta; it is a simple but well presented dish. You can savour the taste of the freshly grilled vegetables. It you like Pizza, this is also the place, they can make the pizza with fresh organic toppings, with or without the cheese! I have not fully explored the full ranges of the food at Real Food Café yet, however, I am so impressed with the food quality that I will name it one of my favourite eat out place. Real Food Café is expending. Its new shop at Killiney Road has just started operations recently. I have not visited it yet, but I will, soon.